Join us as we explore the most famous landmark in Cabo San Lucas! After air-conditioned pick-up at your hotel, we will visit the Cabo San Lucas Marina where we'll explore the heart and soul of Cabo. We'll enjoy shopping in the local area and also get to learn about and sample some of Mexico's most famous product - Tequila! You'll learn the "right way" to drink tequila (no lime or salt necessary) and be introduced to the many different varieties of tequila, and their unique traits. Then we climb aboard a glass bottom boat and set sail for Land's End, where the Pacific Ocean meets the Sea of Cortez. Here, if you stretched a line due south, it would not touch land again until the south pole. We'll have tremendous photographic opportunities of The Arch, the Sea Lion Colony, Pelican Rock, and the most photographed beach in Cabo San Lucas, the immortal Lovers Beach. You can either return to the marina with the tour or you can choose to stay on the beach and relax and swim if you prefer - your choice! Cruise Passengers: This tour is available as a shore excursion. Transportation is included! Want more flexibility? 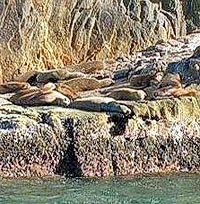 See our Private Land's End Tour for Cruise Passengers. Three Times Daily. Pick-up Times Shown in the Table Below. You can choose the return time to your hotel. If you choose to stay at Lovers Beach, you will need to return with the last tour of the day in order to utilize the return transportation. You can stay longer, but you will need to take care of your own return transportation. All Ages Welcome. Kids prices apply to ages 5-10 years. Kids under 5 are free. Compare to your ship's "Land's End" Shore Excursion! Coming on a cruise ship? If so, you'll see an excursion called the "Land's End Boat Ride with Scenic Stop" tour on your ship's excursion list. Compare this tour to that one and you'll note that our tour includes a tour of the Marina area of Cabo and tequila tasting in addition to the trip to Lands End, for about $17.00 per person less money! Our Los Cabos Deluxe tour includes the trip to Lands End plus a tour of Cabo San Lucas and Los Cabos, and is our recommendation for a sightseeing tour if you only have a few hours to spare.